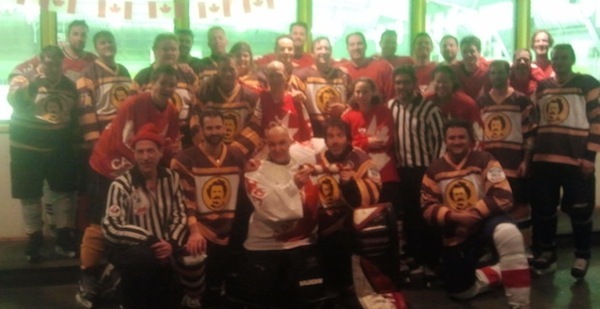 Team Canada '76 (in red) defeated the Red River Rebellion in OT to claim the 2014 Yule Log Championship. TORONTO - Though down by four goals at the midway point of the game, Team Canada '76 staged a comeback for the ages at last weekend's annual Yule Log Tournament, tying the contest late in the 3rd period and ultimately winning the match in overtime by a score of 7-6. The winning goal was potted by Marc Hickox on his third breakaway of the extra frame. Hickox, who started the tourney as a member of the Big Stars before being picked up by Team Canada '76 in the post-round-robin dispersal draft, was originally supposed to compete in the event as a goaltender. This was the sixth consecutive year for the annual holiday tournament which took place at McCormick Arena and saw 33 players from the UUHA and GTHLA participate on three mixed teams.